Can you imagine if astronauts were also sent to space with edibles? I’m picturing floating in a zero-gravity environment, happily stoned, and exclaiming in wonder as I took in the sweeping expanse of the Milky Way. District Edibles wants to help you set sail and touch the stars of your consciousness with its space trippy gummies. They promise “fully activated” premium cannabis oil and each gummy allegedly is low sugar – less than 3 grams of sugar per serving and under 10 calories. After feeling pretty low on a higher pain day, I was ready to go somewhere, anywhere. I sampled these gummies before a meal with friends and below is the full scoop on my experience. Sturdy. Attractive. Multi-purpose. What more could you want in packaging? Often, edibles’ packaging seems like an afterthought and is too flimsy for my taste. I love that District invests in its presentation, because as a consumer, that shows me that they stand behind their product. For instance, I love the effects of Sensi Chews formulation for insomnia but their medicine comes in a small plastic “tub” that resembles extra condiments. It honestly turns me off because once opened, it’s impossible to secure the remaining chewable tabs. I’m happy to report this is so not the case with District’s edible gummies. They are extremely secure in a hard-plastic casing that’s both tamperproof and child-resistant. And, drumroll please, they’re both recyclable and reusable as a joint holder! When I tried slipping a spliff rolled with classic 1 ¼ sized paper, it fit like a glove. I love that. It makes me feel “seen” as someone who does consume cannabis in multiple ways. While the graphics on the outside are fairly refined with gold and white lettering, the inside of the packaging holds a surprise, which again, makes me like this product. The gummies themselves are contained in a foil blister pack which are covered in rocket ships and phrases like “Booster,” “Gravity Check,” and “Accelerator.” It creates a mood of exploration and adventure, and with gummies in particular, I feel like this added layer of personality enhances the overall experience. Unlike the indica, sativa, and hybrid options, this CBD:THC package uses a label at the bottom that outlines dosage info, but it looks like it was printed on a home computer. I would have liked to have seen a nicer label on here as the other District gummies have, so I knocked 0.5 off the rating. While on the topic of labeling, the information covers the basic requirements but doesn’t go into much detail. 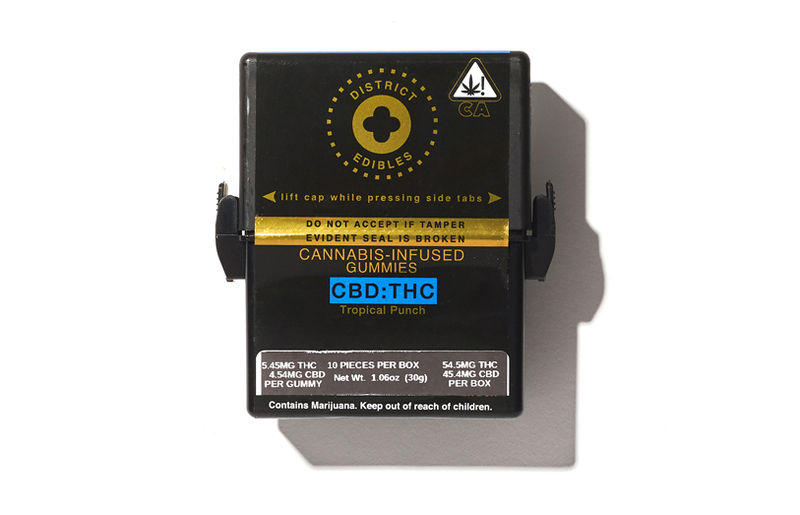 It’s great that they have the ratio of CBD to THC per gummy and per box, opening instructions, government warnings, ingredients, best by date and batch number. After scanning the ingredients, I noticed these are full of artificial ingredients and also have corn syrup, so they’re definitely not what you would call “healthy” edibles. “Cannabis oil (purified using CO2 and/or ethanol)” is also mentioned in the ingredients list, but by including that, District actually raised more questions for me. When they say “purified using CO2 and/or ethanol,” what exactly do they mean? I wonder which strains were used? It would also have been beneficial to see a QR code or another way to double check testing results. A full profile of all of the cannabinoids would also be nice to see. If you’re comfortable with 5.45 mg THC and 4.54 mg CBD per dose, it’s relatively simple to dose in these increments. If you know you need 10 mg of THC, eat two to start. However, if you’re looking for a smaller dose, you can try cutting the gummy in half or biting off a “knob.” However, given this product is a gummy, it’s going to be difficult to cut these down further for precise dosing. Given the packaging’s slip-into-your-pocket-and-go nature, it’s easy to keep hidden when dosing throughout the day. If you take the blister pack out of the external package, there is nothing cannabis related printed on it, making it easy to use. Just pop out of the foil and into your mouth! Chewing is all that’s required. And speaking of chewability, District has got its formula down. It’s a clean experience as the gummy bits don’t get stuck in your teeth like Swedish fish. It feels like Jell-O with a bit more density, which I found very pleasurable and broke down easily in my mouth. That said, flavor is one of the most important aspects of gummies to me. Billed as tropical punch, I expect fruitiness, with notes of mango, pineapple, etc. As soon as I broke the seal on my first gummy, I could immediately smell the classic fruit punch fragrance waft toward my nose. I assumed these would taste as deliciously sweet and fruity as they smelled, but ultimately, the initial waft set me up for disappointment. The gummies tasted like heavily watered down Hawaiian Punch with a spicy and herbaceous cannabis flavor mixed in. It was almost medicinal tasting with a weedy aftertaste. This aspect makes District Edible’s gummies not beginner-friendly. I’m quite accustomed to the taste of rich, skunky cannabis but even for me, these were formidable. It was also overwhelmingly sugary tasting which had me questioning that 3 grams of sugar gummy marketing. The upshot is, when I taste strong cannabis flavors like this, I can safely assume District used more of a full spectrum extract as opposed to a distillate, which I know has more of a medicinal benefit for me. Medicinal, indeed! District Edibles is always precise in their formulations, making this an edible that will give you a consistent experience every time you buy it. Sure enough, I can testify that each gummy I tried had the same potency. Despite the fact that it’s essentially a 1:1 ratio of CBD:THC, I still found these fairly psychoactive. So for the canna-curious reading this review, don’t be fooled! This maker makes sure to create edibles which are heavy hitters. About 50 minutes from the time I ate the first gummy in the pack, I felt it kicking in. Ten minutes later, my hunger started to kick in. This is extremely helpful for me, as due to some health issues caused by Crohn’s disease, I often don’t have an appetite all day and by evening, still haven’t eaten a thing. Now I can happily nourish myself! As my experience continued, after grabbing a bite to eat with friends, I found myself getting a bit anxious. While CBD generally tends to ease my anxieties, this combination of cannabinoids didn’t seem to help in that regard. The anxiety I was experiencing may have had little to do with the edible and more to do with my state of mind and body chemistry at the time, but it also might have been the edible. If you have regular issues with anxiety, like I do, you may want to take caution. Three hours after I had my first gummy, the high started dying down and at about the 5-hour mark I felt like I had sobered up. Aside from the minor bout of anxiety, I felt like this edible allowed me to be pretty energetic and productive. If I hadn’t been socializing with friends and playing strategic board games (which is exactly what I did), I could see myself happily cleaning my apartment or scouring thrift store shelves for deals. For around $15-$18, this is a good price for a gummy that provides potent, consistent results, and is easy to eat and easy to dose. Well-protected in a hard-plastic, child-resistant container. Reusable, recyclable, and doubles as a joint holder? Sold. Fun rocket ship theme; classy graphics with gold, white and bluish purple. Bare minimum for adult-use compliance. Leaves many questions: does “purified” mean the same as “extracted using?” What strains were used, how can we verify lab results? Simple to dose if you’re comfortable with the amount of THC and CBD in a single gummy. Harder to cut and achieve a precise micro-dose. Packaging travels well in jackets or pockets and the foil itself has no reference to cannabis. While someone might see the spaceship spangled pack and be curious what’s inside, they won’t know off the bat these are medicated gummies. These have the “weedy” taste that turn many people off edibles. But if your top priority is effectiveness, then flavor is secondary. Great texture for a gummy: not chewy, but more wiggly, like Jell-O with density. Didn’t get stuck in my teeth, left with a slight oily residue on my hands. Strong stuff, definitely helped me feel elevated, helped me manage pain, and sparked my appetite right up. May have caused a bit more anxiety than I typically enjoy. Other than eating it as a gummy, there’s not a whole lot else you can do with these. Potential to be used as a garnish for a cocktail or suspended in squares of Jell-O, but given the flavor issue, I’d recommend eating them as is. Overall experience was consistent as it could be. Each gummy is a true 10 milligrams and that makes it a good buy in my book. At $15-18 per 10-pack of gummies, this is a fair price for consistently strong medicine… which definitely tastes like medicine. District gummies’ taste could be a little better, but I also get that serious medicine doesn’t always taste great. The other thing I didn’t love was the spike in anxiety I felt, which might be explained by which strain was used (information which was not provided by the labeling). For many, I think the “hit every time” potency is worth the price, but if I buy it again, I would be cautious about it affecting my anxiety. If you live in the L.A. area, you may qualify for cannabis delivery from Nugg Club! Get District Edibles’ gummies and more delivered to your doorstep – click here and enter your address today!